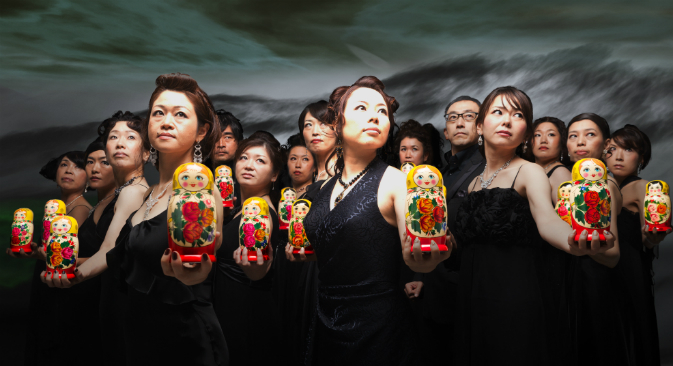 A Japanese orchestra, under the direction of Masami Takeuchi, staged a concert using matryoshka-shaped theremins. Russian musicians also took part in the fusion concert. Moscow’s Multimedia Art Museum hosted a Russo-Japanese theremin concert in late September. The unique event featured the compositions of the heads of the Russian and Japanese theremin schools – Masami Takeuchi, Natalia Theremin and Peter Theremin. The evening's main event was the performance of a Japanese matryomin ensemble under the direction of Masami Takeuchi. The band used a modified version of the theremin, the world's first non-contact instrument, which was invented by Soviet physicist Leon Theremin in the early 20th century. Masami Takeuchi, head of the Japanese school of theremin and leader of the unusual musical ensemble spoke to RBTH about the origins of the matryomin, a matryoshka-shaped theremin. "In 1993, I came to Moscow specially to learn to play the theremin from the famous Russian music teacher Lydia Kavina," he said. According to Takeuchi, there were no theremin performers in Japan in the early 1990s. After returning to Japan, he became the first thereminist in the country's history. In 2003, Masami decided to put a theremin inside a matryoshka doll. "I thought that for the presentation and promotion of this musical instrument in Japan, you need to add a little pop culture," Takeuchi said. He added that matryoshkas are made of linden wood, which works as a very good acoustic resonator. A year after creating the new version of the theremin, Takeuchi formed his first matryomin musical orchestra, and has since taken part in 140 concerts and over 90 television and radio shows. "Thanks to Masami Takeuchi, the matryomin created a whole theremin culture in Japan in a short time," said Peter Theremin, the great-grandson of the musical instrument's inventor and the head of the Moscow Theremin School. Takeuchi is the founder of the Takeuchi Theremin Institute, which publishes the Thereminik monthly magazine. He also founded the Friends of the Theremin association, which currently has about 200 members, and opened a network of schools to teach playing the theremin in Japan.